I really, really, really want to do DIY projects. Fix up furniture, create framed pieces for my walls, and organize my home office to blend in with my guest bedroom. But my skill doesn’t match up with my vision in that area–YET! I would be stretching if I tried to talk expertly about beauty or fashion. I know what I like and that’s it. 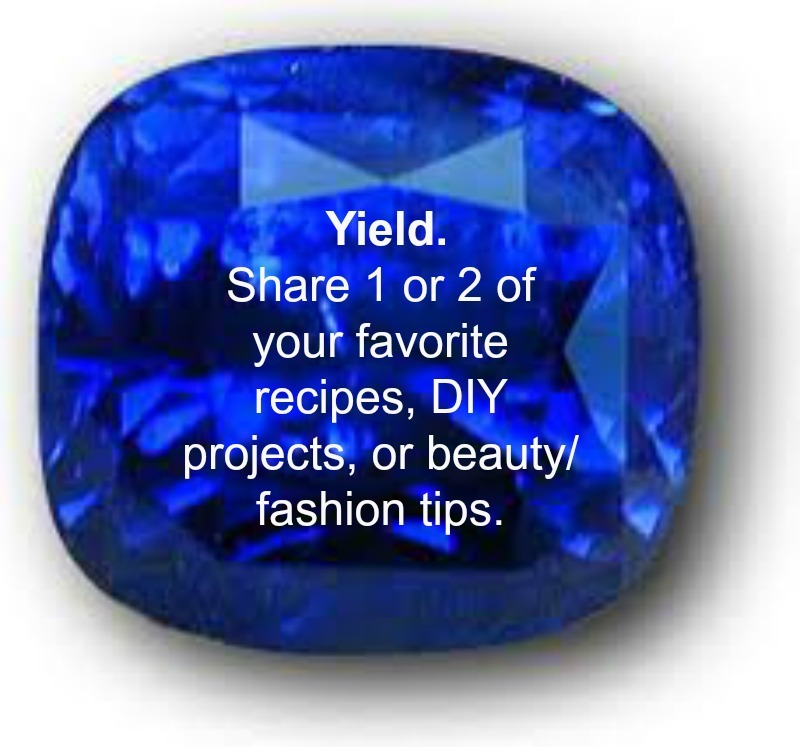 So for this writing prompt of the challenge, I will be sharing 2 of my favorite rigged recipes. 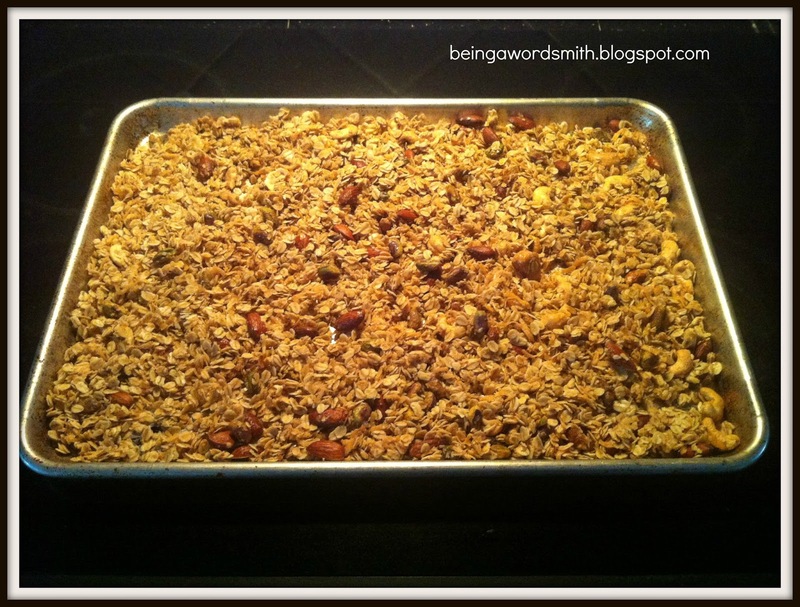 When I first came across the original recipe for a Salty and Sweet Granola, I did not even know that rolled oats were different from regular ones. A bag of a blend of pistachios, almonds, cashews, and peanuts (or 1 cup pistachios, 1 cup slivered almonds, 1 cup cashews). I remove the peanuts from the bagged blend to make it a healthier recipe. The bagged blend also prevents having to shell the pistachios. 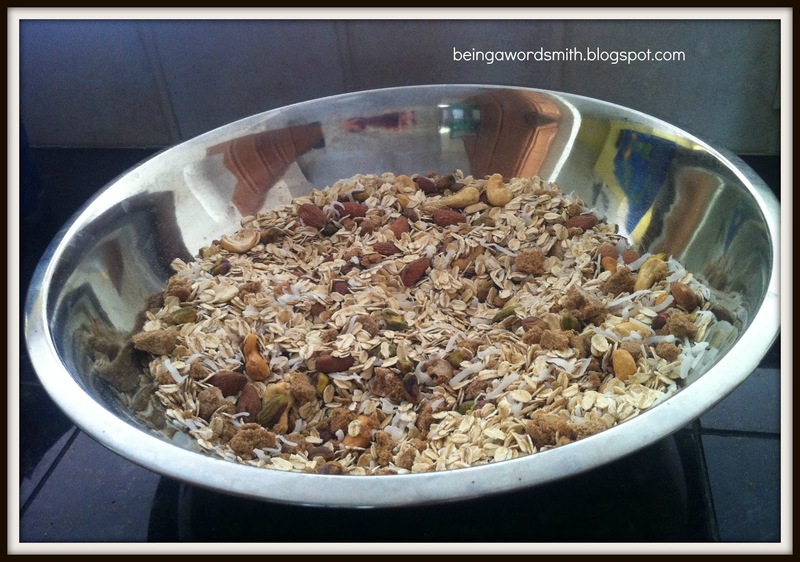 In a large bowl, combine the oats, nuts, coconut, and brown sugar. Smash the brown sugar if it’s lumpy. In a separate bowl, combine maple syrup, oil, and salt. Pour that mixture over the the oats and nuts mixture and stir. Spread it on a greased sheet pan. Cook for 1 hour and 15 minutes, stirring every 15 minutes to achieve an even color. Remove from oven and let it cool a little bit. Add golden raisins, mix until evenly distributed. Enjoy and place the rest of it in an air-tight container. Do you like to mix granola into plain yogurt? Or eat alone? Now I totally confused about oats. I look at your package and then looked at mine, it says old fashioned but not “rolled”. I wonder what the difference is. It must be morning groggy as I sit here an drink coffee because I was wondering why were recipes were “rigged”. I was saying it as “ridged” in my head. Finally said – duh to myself to get back on tracked. NOW the granola seems like something I'd eat too much of all by myself because nobody would eat it so I better wait until I can gift it. It'll be pretty in a mason jar (assuming you can break it up). I will most likely try that soup. Wake up, Kenya! Ha! The difference between regular/instant oats and ROLLED oats is the rolled oats are bigger and take longer to cook. The rolled oats work better in the granola. Yes, you can break it up. My recipes are “rigged” because I adapt them from ones I find on the internet. I make them healthier by substituting ground turkey for ground beef, taking shortcuts, using chicken instead of beef or pork, etc. 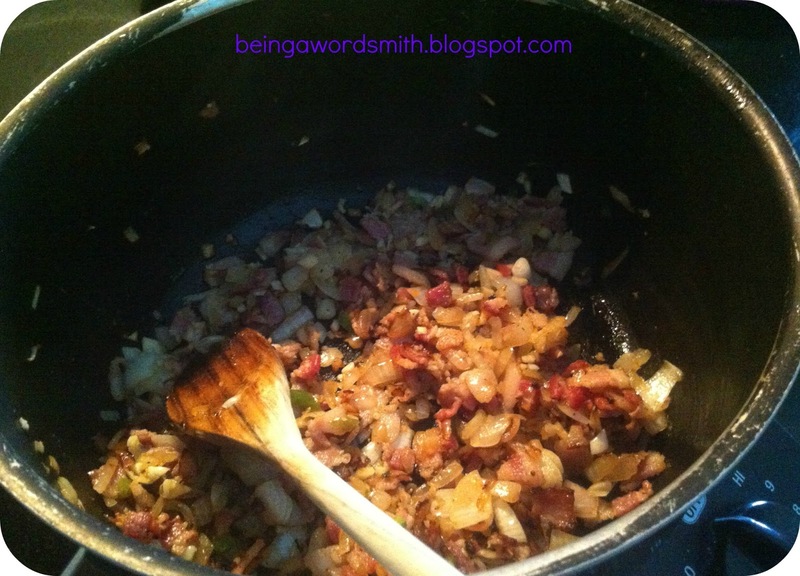 I explain it on my Rigged Recipes page and how I just started cooking regularly 2 years ago. I'm awake now. Dang to my typos. LOL! I will definitely check out your rigged recipes. I grew up a vegetarian (age 7 on). I started eating chicken again when I was 18. Then married a total meat eater at 26. I was able to convert him to ground turkey, and I don't make anything with beef or pork. Always looking for something different to make instead of the same ole same ole. I love ground chicken also! I can't wait to try the Black Bean Soup….. I hope you like it, Paula. I just made a vegetarian chili with black beans and navy beans for the first time. Can't wait to share that recipe. My every morning breakfast is greek yogurt and granola but I've never thought about making my own granola. I'm going to give this a try! It's so easy to do, Mo. I had to start making a double batch, because it goes fast in my house. My recent post September Fave Friday Link Up! It was my first time making anything with black beans and I loved it! That black bean soup looks good! The weather will be cooling off soon, so I'll definitely have to try this one for the fall months. Does it come out really spicy with the addition of the habanero chili pepper? It's not really spicy because you remove the seeds and the ribs from the habanero. It was just added flavor. Yum! Going to have to try a vegan version of that black bean soup!! Ahh – I can almost taste Autumn in the air!! And thanks for your comments, Kimberly ~ you're so sweet! I love being a part of the Sapphire Challenge! You're a wonderful hostess! I appreciate that! I really do love connecting with other bloggers. I learn so much! And I believe in sharing. Looking forward to trying your recipes. I LOVE yogurt, especially with granola. It's such a great snack for kids as well. Mine both love it almost as much as I do. I am a sucker for salty and sweet these days. When I was a kid, my Daddy would always put BBQ sauce on his popcorn. I didn't get the reasoning for it. Now I do! I'm definitely planning to make that soup this fall! It looks delicious! That black bean soup looks delish! I love black beans. Thanks for the recipe. I have been pleasantly surprised by the favorable reaction to this recipe. I hope everyone enjoys eating it as much as I do. Anyhoo…I’m stopping by with some great news: I nominated you for a Liebster Award! Go over to http://learntoembracethestruggle.com/liebster-awa… for details and next steps. My recent post I’m a Liebster Award winner! I am very honored, Alison. Thank you. Of course I accept. You have a great weekend as well. Yum! I love black bean soup. I make mine with orange, lemon and lime juice. Never thought to use ketchup and worcestershire sauce…I will have to try yours too! I am a recipe girl through and through. I rely on them heavily because I don't always know what spices/ingredients will work well together. Once I make it, then I rig it. Thanks, Michelle. 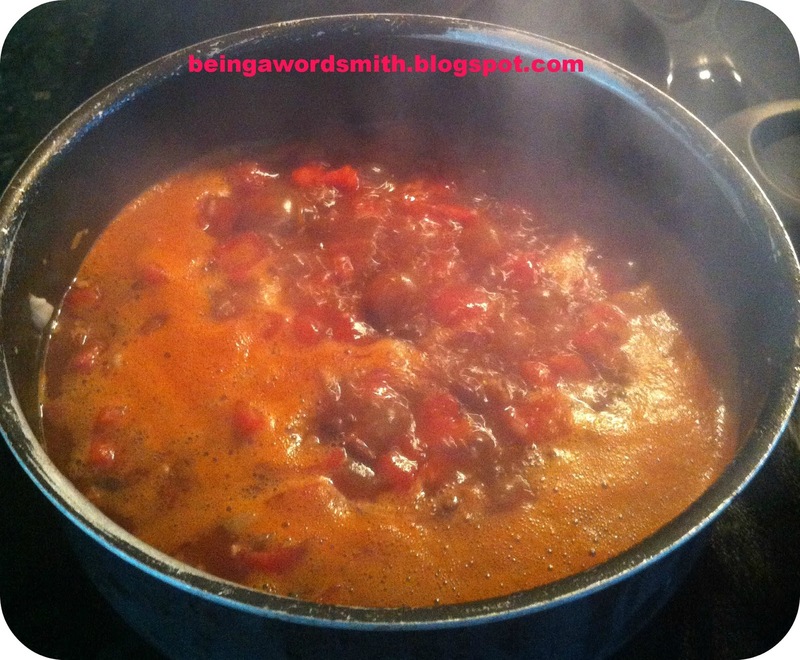 I have pinned this black bean soup! OMG it looks so good Kim! Can't wait! Hope you like it. The garnishes really do complete the dish.